This new Pink Butyl Gasket from Duro Dyne has a special 'H' shaped pattern to provide 4 points of contact to the metal for a secured air tight seal. It also has a lower compression resistance; excellent resistance to water, alcohols, mild acids and mild bases; is non-corrosive; considered a non-irritant for "appraisal of the safety of chemicals in food, drugs and cosmetics"; and can be applied for LEED credit. The pink color is highly visible for easy inspection on the job site while of course furthering the awareness of the need to join the fight against breast cancer. The mission of the Breast Cancer Research Foundation (BCRF) is to prevent and cure breast cancer by advancing the world's most promising research. To help further the cause of the BCRF, Duro Dyne decided to partner with them and hold a machinery auction in 2017 which resulted in $65,885 being raised for Breast Cancer Research. Duro Dyne is continuing its fundraising partnership with the Breast Cancer Research Foundation by contributing $2 to the BCRF for every box (500 ft) of Pink Butyl Gasket sold. you need it at all times. The Pittsburgh Lock Opening Tool is used to open a longitudinal seam that is used in the fabrication of sheet metal ductwork. 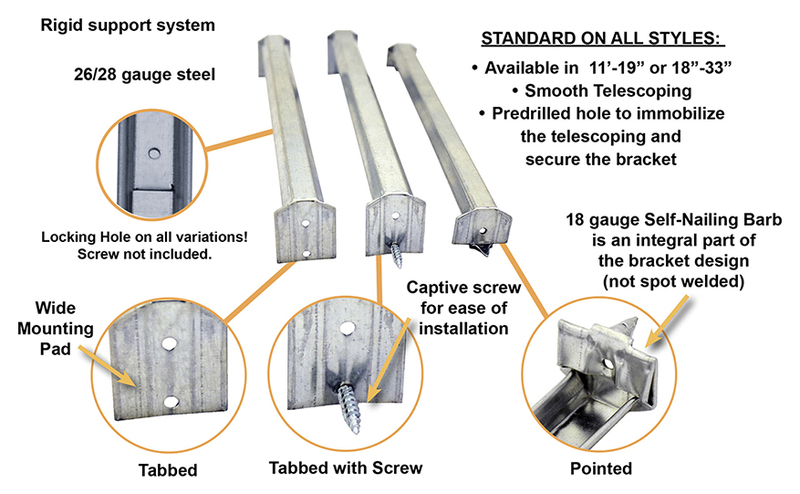 The Beam Clamp is a structual attachment to the top or bottom of metal I-beams, purlins, channel, or angle iron. It comes in a large or small mouth and an Electro-Galvanized or plain finish. It is available for 3/8’’ and 1/2’’ threaded rod. fasteners. The support members are often lengths of strut or angle iron. 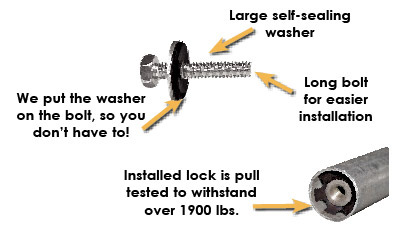 The fastener frequently is threaded rod combined with washers and nuts. Duro Dyne stocks Zinc plated threaded rod in multiple diameters; 1/4”, 3/8”, 1/2” 5/8'', 3/4'', and in lengths of 6 feet, 10 feet, and 12 feet (on select diameters). The rod is shipped in sturdy cardboard tubes. 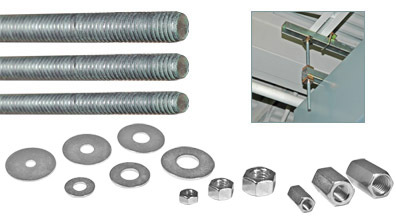 ▪Duro Dyne also stocks Threaded Rod Accessories consisting of flat & fender washers, hex nuts, bolts and rod couplers. These accessories work in conjunction with Duro Dyne Threaded Rod to create a secure system for hanging ductwork and equipment. 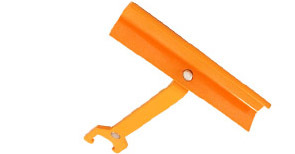 This is a great multipurpose product for use in reinforcing duct or as a mounting angle. ▪The Dyn-O-Mate Crimper installs the TDC or TDF corner and crimps the edge over to hold the corner in place. Install the finishing cleat quickly and easily. The tool pulls the ductwork tight while installing the cleat and creating a quick, easy and clean seal on duct connections over 48''. 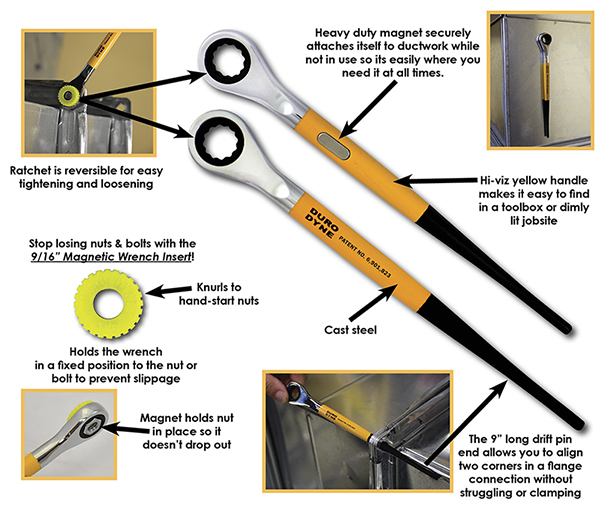 Install the finishing cleat quickly and easily with the Universal Magnetic Cleat Tool. 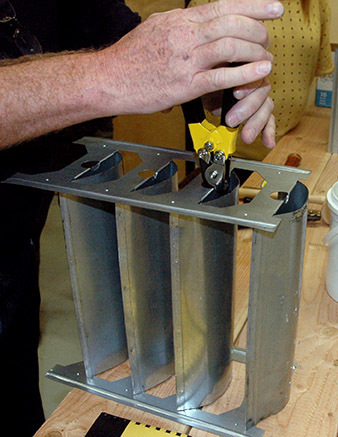 The tool pulls the ductwork tight while installing the cleat and creating a quick, easy and clean seal on all size duct connections. ▪ Replaces tack welding, chiseling, or other awkward and time consuming methods. 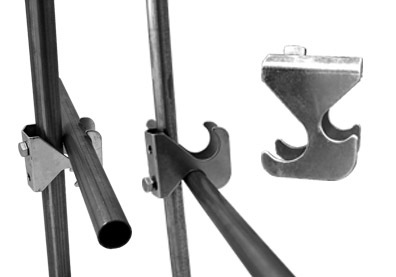 ▪ The Vane Dimpler can be used on the vane before or after placement on the rail. Either way, its locked tight! ▪ No other tools or welding equipment necessary. BTL500 Butyl and NEO750 Neoprene Gaskets offer an easy-to-use sealant to provide a moisture and vapor-tight seal to prohibit water and dust from any connection at any atmospheric pressure. 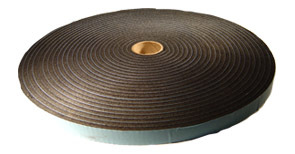 Butyl gasket is used in tape and bead form to seal transverse duct connections systems helping to provide a moisture and air tight seal. 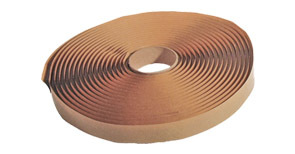 This tighter seal also helps reduce energy waste and noise. ▪ Duro Dyne Butyl gasket can withstand movement without cracking. ▪ Adheres to most dry, clean surfaces such as steel, aluminum, plastics, wood and concrete. ▪ Excellent resistance to water, alcohols, mild acids and mild bases. ▪ All Duro Dyne Butyl Gasketing is considered a non-irritant for "appraisal of the safety of chemicals in food, drugs and cosmetics"
▪ Neoprene gasket tape is a self-adhesive closed cell industrial foam comprised of neoprene, PVC and Nitrile. ▪ Great for use when connecting ductwork that might periodically have to be taken apart for maintenance purposes. Click here to go to our Neoprene Gasketing Selection in Air Regulation Hardware. 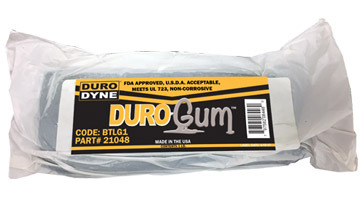 Duro-Gum™ is a convenient way to seal a joint, crack or any opening so that no moisture, dust particles or air can enter the crevice. It is a gray, permanently soft, nontoxic compound which will adhere to clean, dry surfaces including metal, plastic, wood and glass. It will not adversely affect other plastic materials or corrode metals. It also has no adverse effect to human skin. Tie rods can be used to support duct sizes over 48". Dyn-O-Locs insert into the ends of the hollow tie rods to provide a means of attaching the rods to the duct. Available for use in 1/2" and 3/4" I.D. rods they are easily inserted and and have been pull tested to withstand over 1900 lbs. Ductwork is often reinforced with conduit to minimize movement caused by positive or negative pressures. These conduits can twist inside the duct during transit or installation. The Dual Dyn-O-Claw is designed to join the cross section of conduits to immobilize themwhich further strengthens the duct. 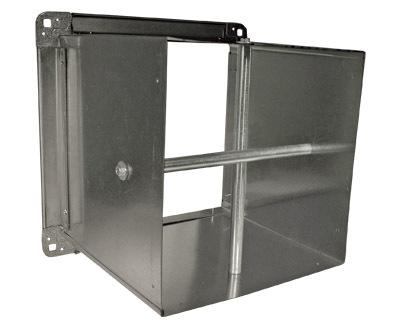 The Dual Dyn-O-Claw also eliminates any vibration or rattling sound of crossing conduit. 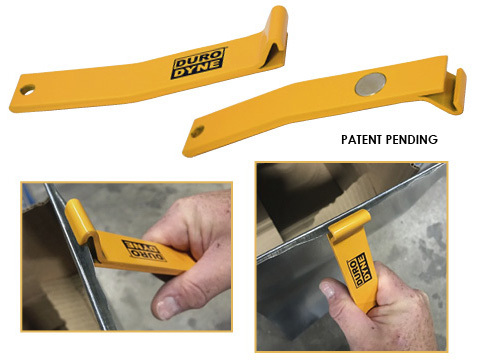 Working in conjunction with Dyn-O-Mate Rod Locks and conduit, the Dual Dyn-O-Claw creates an effective duct strengthening system and are easier and faster than other alternatives such as ties or welding. 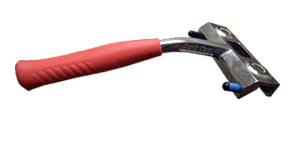 The Dual Dyn-O-Claw works for both 1/2in and 3/4in conduit.